The popularity of social networking sites has resulted in some of the most popular mobile apps, being those that allow users to access their social accounts and timelines on the fly. For that very reason, applications such as Facebook and Twitter are just a couple of the most downloaded apps of all time and will always continue to be popular with users. 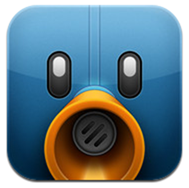 Over the last year, a large number of iOS users seem to have adopted the TweetBot app as their preferred method of accessing Twitter’s micro blogging service while out and about. It was only a few weeks back when Tapbots pushed out a substantial version 2.0 update that brought a number of new features, as well as improvements and the obligatory bug fixes. If you are one of the TweetBot loving iOS users out there then head on over to the App Store as the iPad and iPhone versions of the app have been updated with a variety of changes. Version 2.3 of the app contains a new tweet detail view that has support for displaying inline conversation and replies, and can now be accessed by swiping left or right on a tweet. One of the best features about the TweetBot app is the support for multiple gestures, something that has been expanded in this update with the addition of a left to right swipe that allows users to get back to the main time line quickly from within a tweet detail. The conversation view of the app has also benefitted from a makeover, and contains both the conversation and all replies instead of being two different app areas, and once again gestures play a heavy part in this with a left to right swipe. The way TweetBot handles certain media types has also been updated, with videos being appended with a play icon to allow users to differentiate between video and a static images. A new option for image sharing with the Droplr service has also been included, as well as adding in-app thumbnail support for Vimeo links. In my opinion, one of the best additions is probably one of the simplest and comes in the form of higher resolution image uploads when users are accessing TweetBot via a wireless internet connection. The update is finished off with support for the Arabic language as well as improving the way the app handles emailing tweets and direct message conversations. Finally, for those who like to save tweets for sending at a later time, holding down the compose tweet button will now give quick access to the last saved draft allowing it to be sent out immediately. 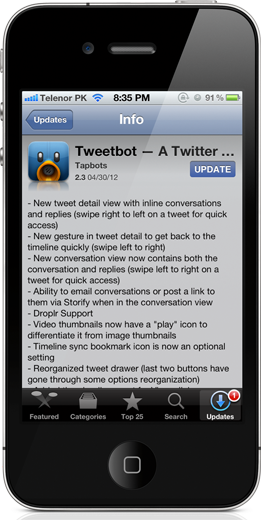 Yet another comprehensive update from Tapbots, definitely containing something for everyone and showing that one of the most popular Twitter apps is still going from strength to strength.